Humans will always make the final decision on whether armed robots can shoot, the US Department of Defense has said. The statement comes as plans emerge for gun platforms that can choose their own targets on the battlefield. The plans seek to upgrade existing aiming systems, using developments in machine intelligence. The US said rules governing armed robots still stood and humans would retain the power to veto their actions. The defence department's plans seek to upgrade the current Advanced Targeting and Lethality Automated System (Atlas) used on ground combat vehicles to help human gunners aim. The military is seeking commercial partners to help develop aiming systems to "acquire, identify, and engage targets at least three times faster than the current manual process". 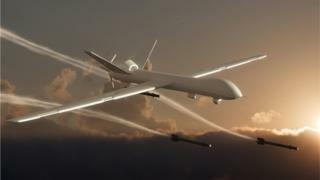 And some commentators feared this would mean systems that could choose their own targets and make an autonomous decision to fire. The US Army then updated its proposal, to emphasise the key role of humans in the aiming process. It said it remained committed to the rules governing human-robot interaction, known as directive 3000.09, which require a human finger on every trigger. The US Army also said it would issue a series of "talking points" around human-robot interaction to be debated on 12 March, when industry is invited to an open day to explore how Atlas can be updated. The US Army was not putting robots in a position to kill anyone, an official told military news site Defense One. Prof Michael Horowitz, a political scientist at the University of Pennsylvania and a senior adjunct fellow at the Center for New American Security, told Defense One: "It is critical that any revisions to the Atlas program... clarify the degree of autonomy and the level of human involvement in the use of force."